In the same vein as 1950’s All About Eve, 1957’s Sweet Smell of Success provides a dark, cynical take on show business. Susie Hunsecker (Susan Harrison) dates jazz guitarist Steve Dallas (Marty Milner). This doesn’t sit well with Susie’s older brother JJ (Burt Lancaster), Broadway’s most powerful columnist. 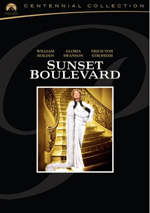 JJ enlists scheming press agent Sidney Falco (Tony Curtis) to break up the couple; Sidney’s uncle owns the club in which Steve plays, so this gives Falco an easier route to push the demise of the relationship. What does Sidney care? He needs JJ’s clout to help his clients. But that won’t be easy to obtain. JJ grows increasingly annoyed at Sidney’s failed attempts to put the kibosh on the affair, and Falco becomes increasingly desperate to do something to move along his own career. The film follows Sidney’s fevered attempts to pursue his agenda by any means necessary. Earlier I compared Smell to All About Eve, and I believe the two possess quite a few similarities. However, Smell boasts a level of darkness and cynicism that puts Eve to shame. Even with all its backstabbing and cruelty, Eve seems like peppy ‘n’ cheerful when viewed against the relentless unpleasantness on display here. Not that this means Smell is a better movie than Eve or that Eve is diminished in any way. While I like both films, I find Eve to be the more enjoyable experience, mainly because it boasts a sense of catty fun that doesn’t appear here. However, Smell does an even better job of depicting seedier aspects of humanity; it’s a rough ride with nary a likable character in sight. Indeed, this is a film that doesn’t much like to spend time away from its nastier personalities. Is it a coincidence that the story’s only vaguely innocent roles – Steve and Susie – are also by far its least interesting? The movie does sag when we’re stuck with them, as they present its weak point. Smell can’t do much with them other than offer them as fairly generic substitutes for Romeo and Juliety, apparently doomed lovers being kept apart due to family. Happily, they’re not on screen all that much. Indeed, Susie and Steve threaten to become a MacGuffin: they motivate nearly all the movie’s action, but their actual relationship is fairly inconsequential. We care less for what happens to them than we do for how their behavior affects the more significant characters. Of all of these, none towers over the movie more than JJ. Lancaster doesn’t actually appear on screen for quite a while, but he offers a dominating presence nonetheless; we hear so much about the All-Powerful Hunsecker that we don’t mind his absence. That’s especially true since Lancaster provides such a strong performance. He never makes even the slightest attempt to add any sense of charm or likability to JJ, which I admire. An actor could easily milk a more sympathetic side of the character, as we could get hints that JJ’s love for his sister leads him to influence her relationship with Steve. But that doesn’t happen. The movie does hint at JJ’s incestuous attraction to Susie but given the morays of 1957, the flick can’t explore this, so we’re left with minor nudges in that direction. In addition, JJ is a tyrant who controls Susie largely because that’s his nature. In Lancaster’s hands, JJ veers from cold to despicable without much to soften his edges. Lancaster gives us a dynamic and scary performance. When compared to JJ, Sidney seems almost likable – “almost” being the operative phrase. 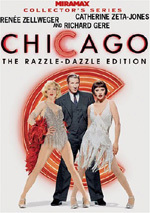 Sidney works from a different place than JJ; Hunsecker behaves abominably because of his cruel nature, while Falco does what he does mostly to survive in show business. This doesn’t make Sidney any less culpable and detestable, though. Indeed, one could make a case for him as the more horrific character simply because he shows occasional glimmers of a conscience – glimmers that he ignores so he can advance his career. While JJ never threatens to feel bad about what he does, Sidney shows these signs, and those make us dislike him even more; we hate him because he’s conscious of the ramifications but acts badly anyway. Curtis lacks the force of nature quality found in Lancaster’s dominating performance, but that’s a good thing, as Sidney needs to feel generally weak. If Falco had the power of JJ, he wouldn’t need to be so obsequious, so Curtis’s ability to deliver a variety of moods and attitudes serves the role well. Of course, most of these are self-centered and unpleasant, but that’s what the role needs, and Curtis seems unafraid to provide an unflinching portrait of a showbiz weasel. Add to this stunning black and white cinematography and crisp dialogue and you have a consistent winner. Smell lacks warmth and charm, so if you crave something uplifting, steer clear of it. If you like to wallow in the rough stuff, though, this one will appeal to you. 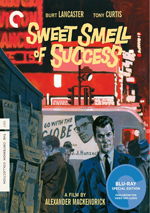 Sweet Smell of Success appears in an aspect ratio of approximately 1.66:1 on this Blu-ray Disc. Criterion has been on a heck of a roll with their older black and white transfers, and Smell continues that line of quality. Virtually no issues with softness occurred, as the movie consistently exhibited terrific clarity and definition. Any instances of less precise delineation stemmed from the original photography, and fine detail was solid throughout the movie; even in wider shots, the elements remained concise. No signs of jagged edges or moiré effects appeared, and edge enhancement remained absent. Print flaws were essentially absent. I noticed a thin vertical line in one shot, but that was about it; the rest of the flick seemed clean. Blacks looked deep and firm, while shadows were quite strong. Low-light shots demonstrated good clarity, and contrast appeared solid. This was a remarkable transfer, and not just for an old movie; it’d look great for a movie made today as well. Of course, the monaural soundtrack of Smell lacked the same age-defying brilliance, but I thought it held its own. Speech could be a little brittle, but the lines were always intelligible and reasonably warm. Music showed decent to good range and clarity; the peppy jazz score displayed more than adequate vivacity. Effects sounded fine. This wasn’t a movie that presented much more than general ambience, so the track didn’t have much to do, but these elements were acceptably clean and distinctive. Source problems weren’t a concern, as the mix lacked distractions. Given the limitations of the original material, I felt this was a more than adequate soundtrack. We find a good mix of extras here. These open with an audio commentary from film scholar James Naramore. He offers a running, screen-specific discussion of development and production company, influences and inspirations, story/character/thematic topics, cinematography, script and dialogue, cast and performances, music, sets and locations. Brisk and informative, Naramore offers a pretty solid examination of the film. He covers production details and thematic notes in pretty equal measure, so he balances the commentary well. Naramore makes sure the chat moves along at a good pace and gives us a consistently terrific piece. We take a look at the film’s director via a 1986 documentary called Mackendrick: The Man Who Walked Away. In this 44-minute, 40-second piece, we hear from director Alexander Mackendrick, producers Thom Mount and James Hill, filmmakers John Milius, Michael Relph, Charles Crichton and Jack Valero, writer Diana Morgan, journalists FX Feeney and Charles Champlin, Mackendrick’s assistant John Sorenson, and actors Burt Lancaster, James Coburn, Gordon Jackson, Joanna Barnes, and Mandy Miller. “Walked” tells us a little about Mackendrick’s personal life, but the majority of the show investigates his career. We find a nice overview of his movie, and not the usual whitewashed one. Instead, “Walked” delivers a robust take on his work and lets us hear about the flops as well as the successes. These factors help turn this into a lively and informative program. Another older documentary comes to us with 1973’s James Wong Howe: Cinematographer. It goes for 21 minutes, 50 seconds and offers info from Howe and director Martin Ritt. The program looks at Howe’s career and delivers his thoughts on his craft. Smart and thoughtful, the documentary allows us an understated look at the cinematographer. I especially like Howe’s demonstration of lighting techniques. Some new video interviews follow. We find these from film critic/historian Neal Gabler (28:57) and filmmaker James Mangold (24:52). Gabler talks about journalist Walter Winchell’s life, career and connection to Smell, while Mangold discusses his relationship with Mackendrick and the director’s influence on his career. Mangold’s chat provides a nice appreciation for Mackendrick as educator, but Gabler’s piece proves to be the most useful, as he delivers a tight, insightful look at the inspiration behind Smell. In addition to the film’s trailer, we get a 56-page booklet. This provides essays from critic Gary Giddins and Paul Cronin, screenwriter Ernest Lehman and director Alexander Mackendrick. Criterion always provides good booklets, but this one’s better than usual. In particular, I really like the writing from Lehman, as he offers greater insight into the script. An acidic portrait of show business and human nature, Sweet Smell of Success didn’t find an audience in 1957, but it stands as a classic now. The movie goes deep into darkness and delivers a crisp, involving drama. The Blu-ray looks splendid via this stellar transfer, and it boasts better than average audio and a fine selection of supplements as well. You’d be hard-pressed to imagine a better release of the film than this.